Chocolate and vanilla may be the classic marble cake combo, but a flash of springtime color inspiration made me want something different from the usual swirls of black and white for my Basic Marbled Loaf. After wondering what I might have at home that would give me a “natural” green swirl (besides frozen spinach, that is), I remembered my tiny tin of matcha tea powder. I used it to tinge half of my batter green, and added almond extract to the other (plain) half. I made a half recipe in my little loaf pan, so I was already on the lookout for a shorter baking time than the recipe suggests, but it sounds like even if you bake a full-sizer, you may want to check your cake several minutes early. My marbling efforts looked more like blobs, but I don’t care too much since it tasted good. I had a slice with some tea while watching the Royal Wedding. For the recipe, see Baking: From My Home to Yours by Dorie Greenspan or read The Bake More, as it was Carol’s pick this week. Don’t forget to check out the TWD Blogroll! Your matcha version looks so tantalizing! I love matcha green tea! How original! I love how the marbled cake looks. How does the matcha tea swirls taste? How beautiful! I have wanted to try Matcha in a dessert for a long time but have never gotten around to it… This looks so pretty though! I can do this for St. Patrick’s Day next year, great idea! Mine was pink and white…no dark chocolate for me…but then you probably guessed that already. 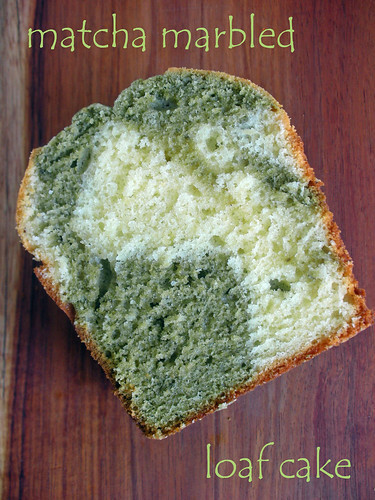 Wow, matcha cake! Looks great. Macha Powder! What a creative twist. Love it. Well I think your marbling looks great. As long as it tasted good, that’s all that matters. looks delicious! i made matcha creamcheese blondies a few wks ago they turned out divine i love matcha anything reallyy!